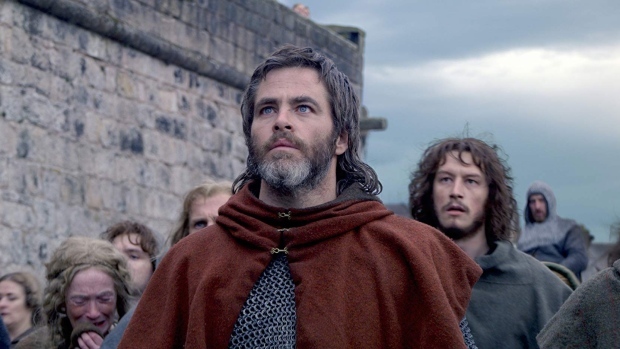 Chris Pine is seen during a scene in Outlaw King. Netflix's historical epic “Outlaw King” took the spotlight on opening night at this year's Toronto International Film Festival, but many critics felt its massive scope was suited best for theatres. That presents a challenge to the streaming service, which hopes audiences stay home to see Chris Pine as a Scottish king who wages a bloody fight for power. Pine stars as Robert the Bruce, a real-life figure known as the King of Scots, who gathered a crew of loyal supporters to battle the King of England - and make Scotland an independent nation. The sprawling film debuts Nov. 9. Julia Roberts leaps to television with “Homecoming,” a twisty psychological thriller that begins with her as a caseworker at a transitional support centre for soldiers returning to civilian life. Years after she's left to start a new life, she's confronted by a U.S. Department of Defense auditor who's investigating an incident and wants to know why she suddenly quit the job. The questions send her down a rabbit hole of repressed memories and the truth behind what she was telling herself for so long. “Homecoming” co-stars Sissy Spacek and Shea Whigham and makes its debut Nov. 5 on Amazon Prime Video. Seven-part limited TV series “Escape at Dannemora” dives into the unbelievable true story of a prison break, tangled in a love triangle. Patricia Arquette plays the supervisor of a New York state prison tailor shop who's carrying on affairs with two of the inmates (Benicio del Toro and Paul Dano). After gaining her trust, the two men convince her to help them escape, leading to a statewide manhunt that captured headlines in 2015. The seven-part weekly series is directed by Ben Stiller and begins Nov. 18 on CraveTV. Here are the lists of movies and TV shows expected in November. Release dates are subject to change.